Find hotel near Winery Nanni Or Bodega Na .. This is one of the finest wineries in Cafayate with a lovely grass patio. Take a tour, opt for a wine tasting session and explore the organic range of wines on your visit. A petite restaurant offers dishes that can compliment your wine tasting affair! The tour of the Vineyard is free, but wine tasting has applicable charges. How popular is Winery Nanni Or Bodega Nanni? 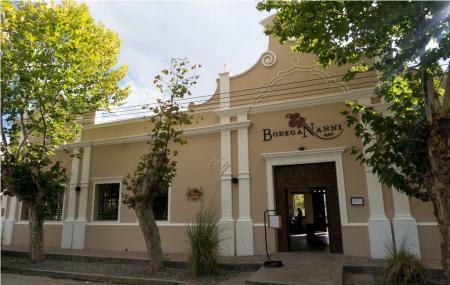 People normally club together Bodega El Esteco and Museo Arqueologico while planning their visit to Winery Nanni Or Bodega Nanni. Great wines and delicious food for a very reasonable price! There was a bit of delay with the food service but we didn't mind because the waiter warned us beforehand and made sure we have plenty of cheese to snack on while we wait. Good food and good wines. A pity we HAVE to do the tour to taste wines. We tasted a few during lunch by purchasing them by the glass. The visit was interesting, and the wine tasting was cheap and good. A very beautifull place. We had a really nice diner. We will come back..!